Phase one of the City wide water infrastructure rehab project is well underway with the completion of South Columbia and highway 11 south portions being completed by the end of this week. Flyers were passed out to all residents in the Ponderosa community this week advising them the water project in their area will begin this month. The contractor will begin work on Jackson Landing road the week of April 15th and will be moving into Ponderosa following the completion of Jackson Landing road. We appreciate the patience of the residents during this project. All questions should be referred to the Public Works department at 601-799-0602, 601-798-0031, or “311”. The City of Picayune owns and operates its water and gas systems. Four water wells and water towers serve 4,974 households and businesses from the Pascagoula aquifer. The approximate 80 miles of Natural gas piping serves 1,784 households and businesses. The installation of Automatic Meter Reading or “AMR” on our water and gas system has achieved a higher level of accuracy and efficiency in our meter reading process. Boil Water Notices are Posted on the City of Picayune FaceBook page, and Flyers are handed out to each home by use of a doorknob hanger. Conducts all maintenance and repair of roadways, drainage systems, traffic signage, and sidewalks within the city ROW. Modification and construction of drainage systems are performed as well, with the assistance of the cities engineering department. Yard debris collection is now contracted out to COASTAL ENVIRONMENTAL SERVICES. The City offers curbside collection of scrap metal of any kind, white goods [refrigerators, freezers, washers, dryers, etc. ], as well as tires, or these items can be delivered to the Public Works Facility @ 101 Witthauer Lane. Provides lawn maintenance services to all city-owned green spaces, such as medians, parks, and all City-owned cemeteries, [Palestine, 8th St. and Thigpen] and ROW. Pest control is provided seasonally. Daily vehicular spraying, manual spraying of drainage systems and educating the public is conducted to protect our citizens from the threat of West Nile & Zika Viruses. Please call “311”, 601-798-0031, or 601-799-0602 for matters relating to these services. Yard Trimmings / Leaves / Yard clippings MUST be bagged. Furniture Items [includes bed mattresses]. 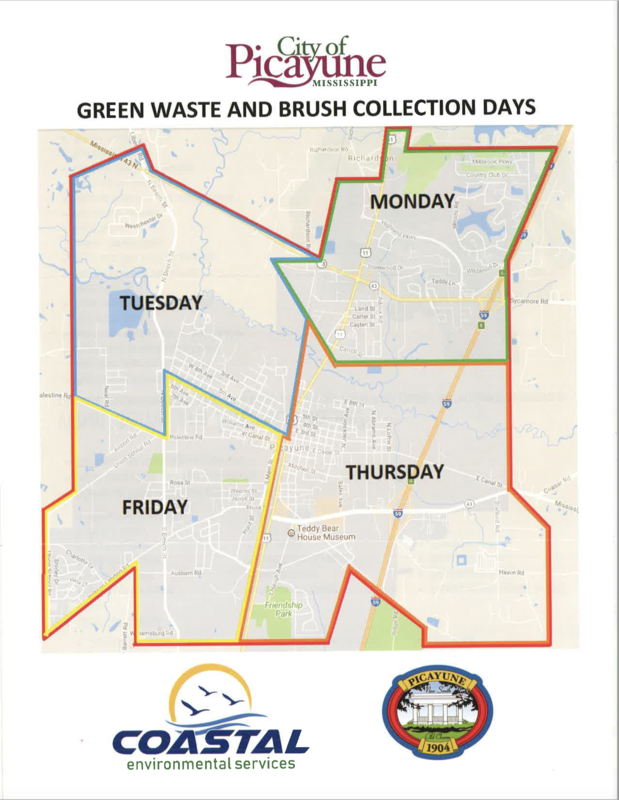 For pick-up days see GREEN WASTE & BRUSH COLLECTION map. 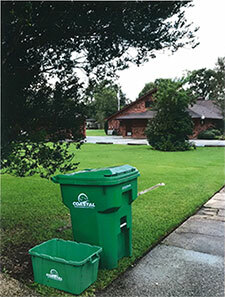 All RECYCLE is collected on Wednesday throughout the City. 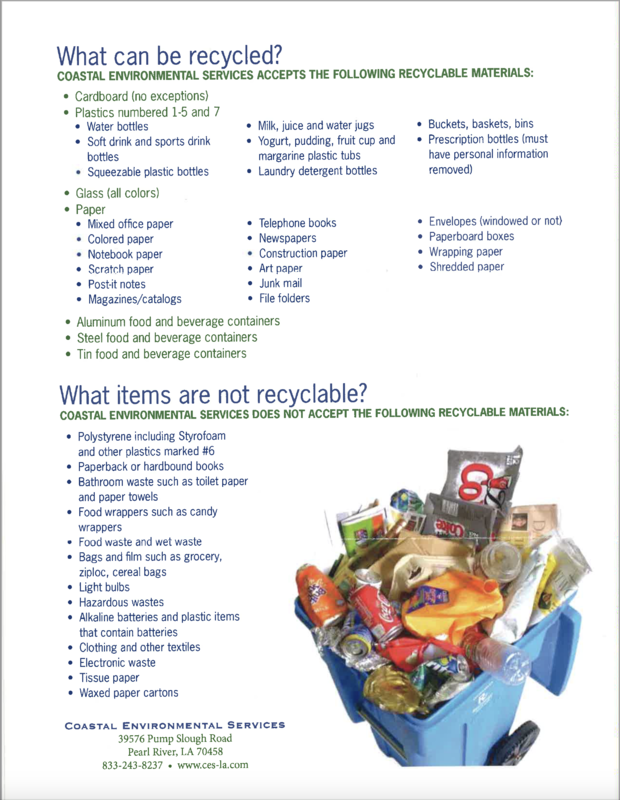 For items that can not be recycled, please view the following flyer.